Setting up and running a business can be incredibly rewarding but there are also many problems to be faced. Not only are there economic pressures to be handled but there is a huge amount of administration, law and regulation to be understood and implemented. Any shortcomings in a company’s operations may cause serious problems further down the line. That is why the right information at the right time can be crucial to a business’s chance of success. The Forum of Private Business Employment Guide 2019 is a comprehensive, detailed and up to the minute examination of the procedures, practices and paperwork that every business needs in order to flourish and succeed in today’s competitive and challenging commercial environment. Operating in tandem with the Forum’s membership helpline it is an essential tool for all members alike. In addition to these key elements, businesses need to know that they have access to legal advice whenever they need it and that why the Forum has teamed up with rradar, a law firm that specialises not only in the expert management of legal crises but also the education and prevention of them in the first place. Rradar proves legal, regulatory and risk management advice and support to the Forum and, in many cases, representation to members during investigations, prosecutions, Employment Tribunals proceedings and Civil Court proceedings. If a crisis arises, you can access rradar’s legal team who can advise on how to work with the Police, HSE and all investigating and regulatory bodies. Discussions and advice provided by rradar’s legal team are legally privileged meaning the advice given is protected and confidential. Supported bu rradar and with the full resources of the Forum behind it, the new Employment Guide 2019 is an essential tool for business owners wanting to run a business successfully. 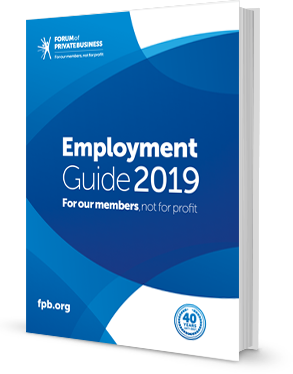 For more information on how you can become a member of the Forum of Private Business and obtain a copy of the Employment Guide 2019, you can speak with our team today on 01565 626001.